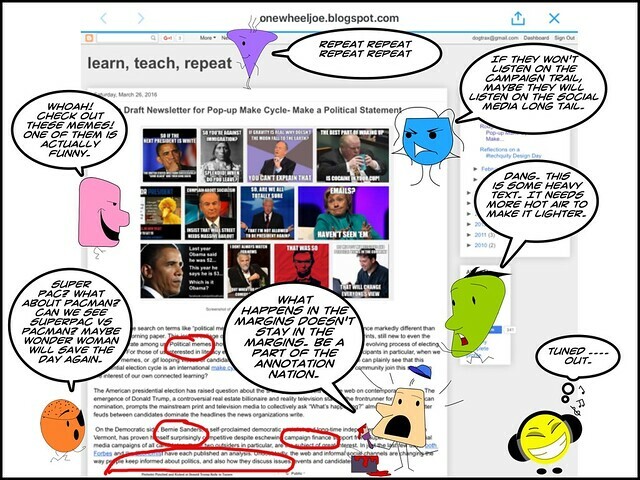 Here is another example of the “long arm of the CLMOOC” — Terry Elliott and Joe Dillon are launching an impromptu Pop-Up Make Cycle this week that invites everyone and anyone to join in the annotation of political pieces about the volatile and unpredictable American presidential race. Joe and Terry are selecting some articles to mark up, but you and I can share out our own pieces, too, and invite others to annotate along with us. For example, I have been tinkering with this one about the role of Independent voters, via Medium. This link will bring you to the annotation overlay. How will the crowd-annotation work? Many of us have been playing with the Hypothesis add-on tool for some time, and we find it has a lot of value for crowd-sourced annotation (along with some drawbacks around visibility). 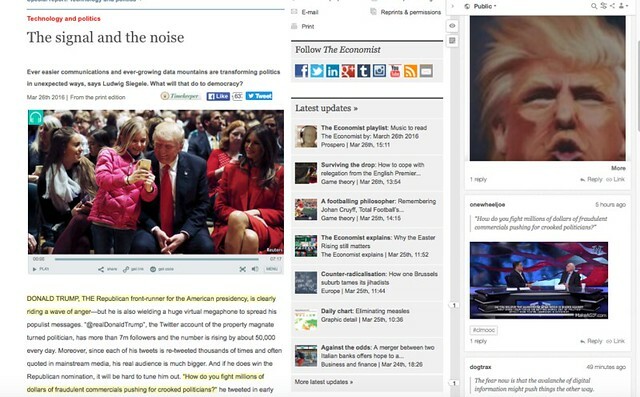 It allows you to layer on comments and media into the margins of the article. Whole conversations can unfold as another layer on the web. But there are other ways to annotate — you could write a blog post about something you have read and share the link; you could use the Diigo bookmarking site, which also allows you to crowd-annotate articles within the Diigo environment and kicks out a shared link; or you might just want to remix articles in your own fashion. If you know anything about CLMOOC, you know you do what speaks to your own interests. Here is one example of Hypothesis and a shared annotated text. Or, if folks use the “CLMOOC” tag in Hypothesis, we can view all of our shared annotations together in one stream. Check out what I mean. 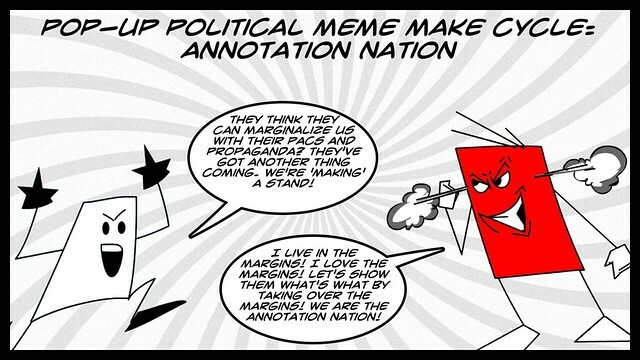 We are all part of the Annotation Nation now. Come join Terry and Joe and the rest of us. Make your voice heard, even if it is in the margins. You can use the #CLMOOC hashtag on Twitter or share in the CLMOOC G+ Community. Make a video. Create meme or GIF. Do what you want. Take part in the Make with Me live session on Google Hangout that Terry and Joe are planning for Tuesday night (tomorrow) at 7 p.m. EST. This entry was posted in Homepage, Making Learning Connected MOOC, Technology Resources. Bookmark the permalink.